If you have Jupiter in Leo, you are generous, kind, compassionate and altruistic. You have organizing and executive abilities and crave positions of trust and responsibility, never being content to simply follow. You have an abundance of energy and a strong constitution. You love anything that tends to uplift society. On the negative side, though, you can become cruel, sensual, egotistical, ostentatious, abnormally fond of pleasure and subject to loss through speculation and gambling. You need to be admired for your generosity and warm-heartedness to all. 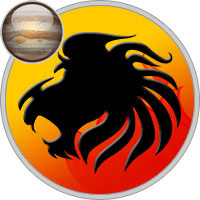 Jupiter in Leo denotes vitality, courage, pride, self-reliance, natural nobility, and expands your executive and leadership abilities. If afflicted (especially to the Sun), however, you may be extravagant, ostentatious, self-centered or overly proud. With your need to express your emotions, you’re dramatic, a born entertainer and salesman, and love to impress others in a big way. You probably have a big ego and rash judgment. Be careful of putting on too much weight with this placement of Jupiter, as that could exacerbate a tendency towards enlargement of the heart (particularly if Jupiter is in the sixth house and in bad aspect to the Sun or to the ruler of the sixth).